Monarch Pass, CO – Ski and snowboard terrain at Monarch Mountain currently occupies the east side of Monarch Pass, which forms a section of the Continental Divide in Colorado. According to a draft Master Development Plan (MDP) just released by the ski area, however, officials want to cross the Divide to expand Monarch Mountain into Gunnison County to the west. The plan calls for an additional 62 acres of cleared trails and 58 acres of gladed skiing and riding in what’s known as No Name Basin on largely west facing terrain. A fixed grip double chair would provide uphill transport, and a warming hut is proposed for construction at the base of the new lift. The MDP was prepared by the ski resort planning firm SE Group for the 800-acre ski area, which first opened as a Works Progress Administration (WPA) project in 1939 and sits entirely on National Forest Service land. 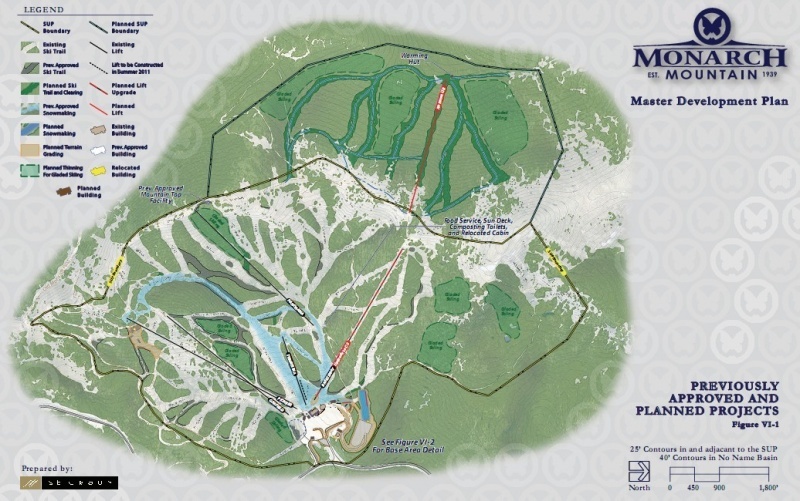 The proposal would increase Monarch’s skiable acreage to 1,144, with the proposed additional ski terrain in No Name Basin primarily intermediate in pitch. In addition to the expansion into No Name Basin the draft MDP references several projects previously approved but not yet implemented by the resort, including an upgrade to the Breezeway lift, a new surface lift located between the Tumbelina and Breezeway lifts, a new trail connecting the Turbo and Sleepy Hollow runs with Mirage, and 36 acres of new ski terrain to be gained primarily by widening existing trails. Some of the latter has already been completed. 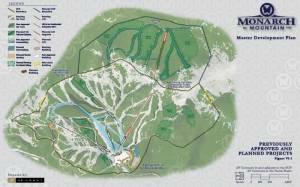 The U.S. Forest Service has also previously approved a new mountaintop facility at the summit of the Panorama lift, a small mid-mountain lodge and limited snowmaking capacity on 33 acres. Resort officials have dropped plans to implement several other previously approved projects including a surface lift to the Gunbarrel run, a new snowplay area and the expansion and relocation of the mountain’s maintenance building. Resort officials argue that a 20% increase in skier visits over the past six years — from 140,000 to 170,000 annually — necessitates the expansion. The expansion would increase the resort’s comfortable daily capacity from 2,870 to 3,490 guests. An open house has been scheduled in Salida, Colo. at the Steamplant from 6 to 8 p.m. on Tuesday, June 1 to solicit public input on the plan. Monarch’s CEO, Rich Moorhead, has said that he hopes for final approval of the MDP by this fall.